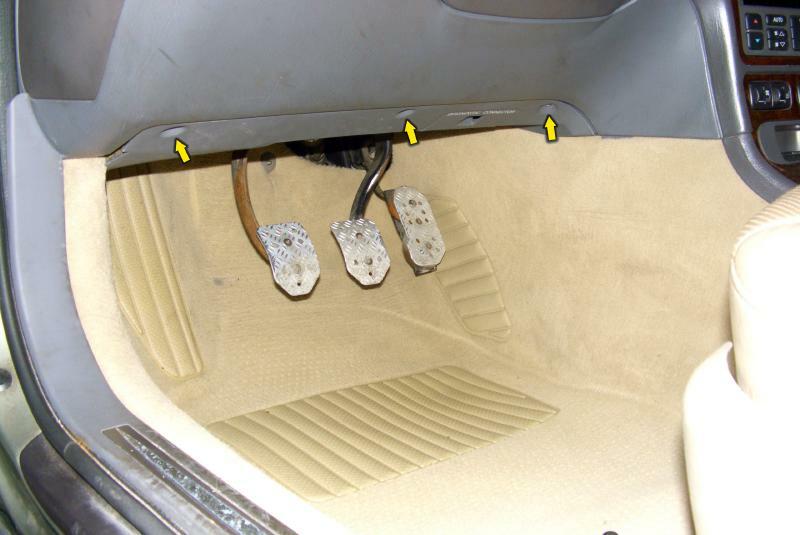 Undo the Torx screws holding the trim in the driver's footwell. ACC blend door repair on a 1999 Saab 9-5. If your air vents blow cold in the winter, or hot in the summer, if the A/C calibration shows error code 08 on the climate control display, then you probably have this problem. It's very common, especially on early 9-5s. The climate control system has an air mixing flap on each side. They mix cold and hot air, so the temperature can be controlled separately on the driver and passenger side. Each flap is operated by a small stepping motor. The range of movement is limited by a short plastic stop arm. Its function is critical, because the mixing flap can cross its path with other moving parts if misaligned, and cause irreparable damage. The ACC can detect when the stop arm is broken and stop the motor. Timely repair is important to prevent further damage. Don't put it off after the problem presented itself. A cracked stop arm or a broken shaft tip can be easily repaired. In more severe cases, the may snap inside the unit, which can only be fixed by removing the ACC module from the car and taking it apart, which is extremely labour intensive. There are various repair kits available from many online Saab parts retailers. The only tools you need for the job is a pair of Torx and Phillips screwdrivers.